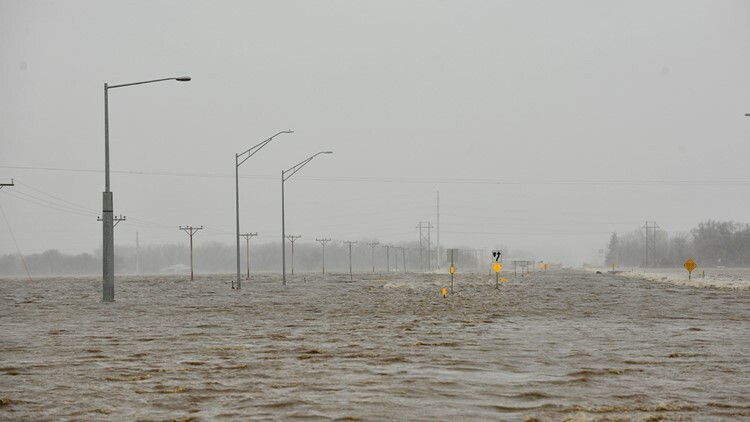 The state's emergency management office said Nebraska is fighting to deal with "historically catastrophic conditions statewide." Nebraska is nearly underwater. Historic flooding, coupled with some unfortunate disasters, including a levee breaking near Fremont and a dam breaking along the Niobrara River on Thursday, has caused severe damage and water to inundate to the state beginning earlier this week. The Nebraska Emergency Management Agency, along with several partner agencies, continue to work to mitigate damage and provide resources to those hardest hit by the storm. For those hoping to donate, please be wary that scammers will start many fraudulent charities hoping to capitalize on the destruction. The state has begun the Nebraska/Southwest Iowa Red Cross Disaster Relief Fund - to donate, head to this link. At that link, you'll find ways to help, from volunteering to donating blood or money. Evacuations are ongoing throughout the state, according to the Saturday morning update from the state's emergency agency. Travel is considered extremely dangerous as conditions continue to change moment to moment. Unless you must travel, do not, state officials warn. The levee near Valley has "overtopped" and could be breached - which would flood the region. State emergency officials said it was impossible to find out if the levee was broken because the area was inaccessible. The state is trying to figure out a way to reach it. According to the National Weather Service's Omaha office, a levee breach has also been reported as of 8:20 a.m. Saturday on the northwest side of Fremont; a flash flood warning is in effect for 31,000 people in the area until 9 p.m.
All evacuation notices issued in the state, no matter if they are suggested or mandatory, should be heeded, the state warns. If residents ignore evacuation recommendations, they could be forced to remain where they are for some time if they become trapped. As of 7 p.m. Friday, 41 cities, 53 counties and one tribal area have declared emergencies in the state. Reports are still floating in of people on roads slowing down to get pictures of video of the devastation; the Nebraska Department of Transportation asks people to stop - especially if they're on Interstate 80 traveling across the Platte River. Unexpected slowdowns cause confusion and accidents. Troopers with the Nebraska State Patrol have been working with local officials and Nebraska Game and Parks officers on water rescues throughout Friday night into Saturday morning, the state says. State patrol has also deployed two lightly armored vehicles to help with rescues in north-central and northeast Nebraska. These types of vehicles can reach places normal rescue vehicles can't. The state says troopers are also being moved around from less affected areas to the more affected areas; additional troopers have also been called in from required days off to help. According to a late-Friday update from the state's National Guard unit, members have joined in to help by offering aerial observation of the flooding - an important step in recovery. Nebraska Gov. Pete Rickets and Maj. Gen. Daryl Bohac surveyed the damage and held press conferences in Omaha and Norfolk, Nebraska, to provide information on the very latest. The Red Cross of Nebraska and Southwest Iowa has opened or partnered with 10 shelters across the region - an exact location and list can be found at this link. Anyone displaced from their homes is welcomed at a shelter. Volunteers are on hand and will provide a safe place to stay, sleep and eat. Part of what's to blame for such intense flooding is the general inundation of the Mississippi and Missouri River Basins, according to the National Oceanic and Atmospheric Administration, is historic river flooding that will likely continue throughout the weekend. Widespread flood warnings and advisories remain in effect, especially in eastern Nebraska, Iowa and southern Wisconsin, the NOAA said. In a post shared almost 8,000 times in less than a day, a woman named Lindsay Ogle wrote a public Facebook post inquiring about the media coverage or lack thereof. "We are a 'flyover' state," she writes, "we are the 'deplorables.' We are 'not for everyone.' We are not newsworthy and I have yet to see or read one article on national news about our devastation." While NBC News and CNN have both covered the story on a national level, news stories about the tragedy occurring in Nebraska appear far and few between - especially outside of the state. From aerial video and photos, it appears whole communities have been washed away by the storm. Maj. Gen. Bohac with the state's National Guard posted a video to Twitter Saturday morning showing areas as far as the eye can see covered in water. "We are hurting," Ogle begins her Facebook post. "We are flooding. As in - half the state under water. Entire towns under water. Massive structures/bridges/roads are floating away. Dams breaking. Rivers jamed [sic] with and without ice are overflowing." Ogle says on Facebook that the state is strong: "We pray. We care about one another. We help our neighbors. I'm proud to be from here. I'm sad to know that it'll take years to recover from this. But the sun is out today and the winds have calmed (compared to yesterday, at least)." Ogle ends her post by asking for the country's prayers and support. She is also asking, intrinsically, for the country's attention as well.